Welcome to the McKenzie's help center. Search our FAQs and Community articles below or Submit a request. ★ What is Bi-Carb Soda? Does McKenzies Bi-Carb Soda contain gluten? How do I make my own self-raising flour? Is McKenzie’s Bi-Carb food safe and is aluminium added? What is the difference between Baking Powder & Baking (Bi Carb) Soda? What is the difference between gelatine powder and gelatine leaves? Why is gelatine not setting my recipe? What is McKenzie’s gelatine made of? What is gelatine bloom strength? What is the gelatine leaf to powder conversion? Why are there "blonde" or "yellow peas" in the Green Split Pea packs? Do all legumes contain gluten? Is McKenzie’s coconut gluten free? Why is sugar added to Moist Flakes Coconut? Is Clive of India gluten free? Are McKenzie’s herbs and spices gluten free? Is coconut flour or quinoa flour a direct substitute for wheat flour? What is the difference between Rice Flour vs. Ground Rice? Why is McKenzie’s Sago also labelled Seed Tapioca? What is the country of origin of Borax? Can I use a product past it’s Best Before date? What is McKenzie’s allergen control program? 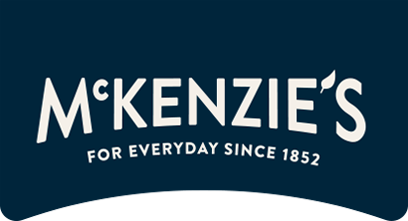 Are any of McKenzie’s products genetically modified?